Stay-and-play: Per-person golf packages range from $130 (Spring/Fall, one night) to $450 (Three Night/Four Day). Our tour of West Virginia golf venues ended on a decidedly upbeat note with a round on the Lakeview Course at this popular resort. I'd never before visited Lakeview, but the place felt familiar and friendly as the bus carrying yours truly and eight other golf-travel writers pulled up to the entrance of the main lodge. As near as I can reckon, this resort opened in the early 1970s and has remained a popular destination for golf travelers from Ohio, Pennsylvania and other neighboring states. The user-friendly price structure of the resort's stay-and-play packages has much to do with the enduring popularity of this golf destination. So does geography and accessibility from Interstate 79. In addition to the main lodge, Lakeview Resort and Spa has cottages and manor houses available at reasonable rates. The resort offers a nice array of amenities, from a restaurant and bar to first-rate fitness center. The resort has two courses - Lakeview and Mountainview. 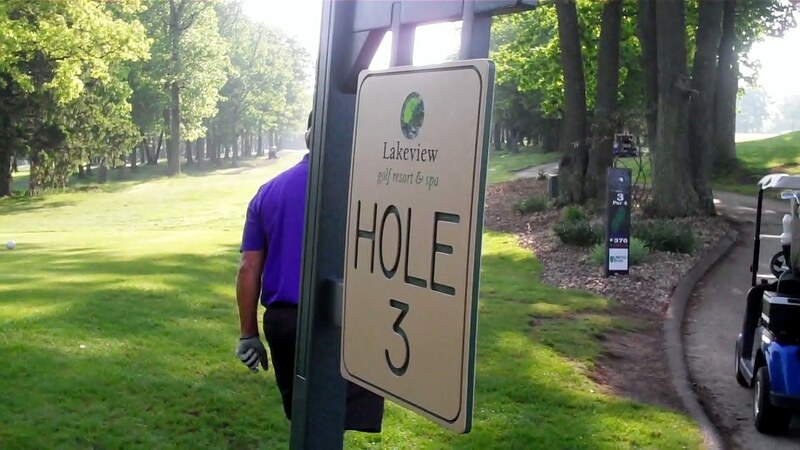 We played the Lakeview Course, which fully opened in 1954 and is the older of the two. From the par-4, 317-yard first hole to the par-5, 620 yard 18th hole, the Lakeview Course serves up an enticing blend of challenge and scenic beauty. The putting surfaces were first-rate. Especially on the front nine, there are outstanding vistas of nearby Cheat Lake. This overview is being written about 10 days after my stay at Lakeview. The resort gets mixed reviews from guests who've chosen to submit comments on travel websites. Most of the complaints center on the condition of rooms in the main lodge. In the opinions of those former guests, the rooms are in need of updating. I was there for only one night, but I would say the place has held up well. My room wasn't posh, but it was clean and comfortable. A fellow guest with whom I spoke at some length said he and his family were spending six nights in one of the manor houses while in Morgantown for a wedding. He wasn't a golfer, but said he and the others staying in the manor house were having a fine time.